ARLINGTON, Va. (CNS) — In late February Father Mauricio Pineda, parochial vicar of All Saints Church in Manassas, heard from a couple he had married a few years ago. The husband had been detained by immigration authorities. They just had a baby four months ago. They didn’t know what to do. Father Pineda gave the best advice he could: Trust God. Keep praying hard. And he promised to pray for them, too. The conversation was one of many such calls Father Pineda, and priests throughout the Arlington Diocese, have taken during the last few weeks amid increased enforcement of immigration laws. 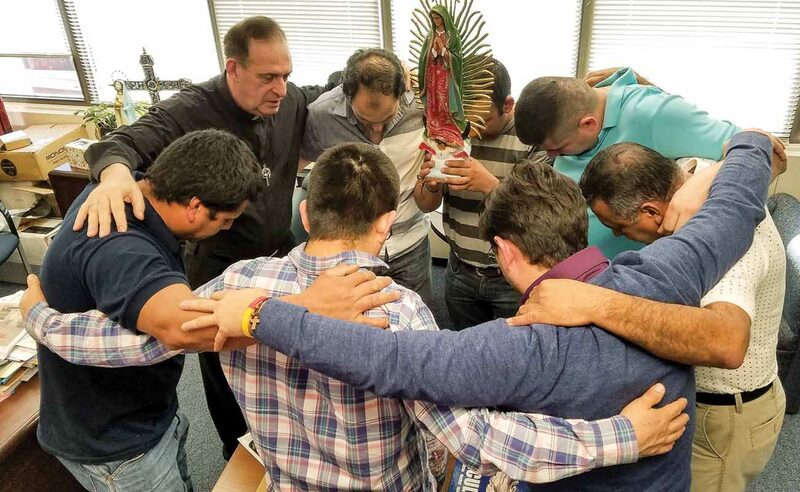 In a time of personal crisis, immigrants in the country without documents are turning in large numbers to their church for spiritual counsel and practical legal assistance through Catholic Charities. “I’ve been living in this country for 18 years now and I’ve never seen this kind of pressure and fear,” said Father Pineda, who is originally from El Salvador. News of raids and detentions had spread among immigrants well before a Feb. 21 memorandum from the Department of Homeland Security outlined a policy of enhanced enforcement of existing immigration laws. The memo directs Immigration and Customs Enforcement to hire 10,000 agents, and expands priorities for deportation beyond those convicted of a violent criminal offense. The expanded priorities include: those who are charged but not convicted of a crime; have misrepresented themselves in any official matter before a governmental agency or engaged in fraud; abused any public benefit program; are subject to a deportation order but have not left the country; or pose a risk to public safety in the judgment of an immigration officer. Unauthorized immigrants who have been in the U.S. less than two years, no matter where they are captured, now also may be subject to “expedited removal,” bypassing due protection such as court hearings. Previous policy had limited such removals to immigrants who were in the country no more than 14 days and arrested within 100 miles of the border. ICE also plans to publicize crimes committed by these immigrants, rescind privacy protections and build new detention facilities. Some unauthorized immigrants, already used to staying below the radar, are now taking extreme precautions to avoid detention. When it comes to immigration, the church balances two values: the dignity of every individual and the right of the state to enact just laws, said Father Thomas P. Ferguson, vicar general and pastor of Good Shepherd Church in Alexandria. The church offers spiritual and practical support to immigrants and others in light of these teachings — with respect for the law. The government also has a duty to be careful how it implements those laws, he added. Not every person in the U.S. without legal permission should be treated as an equal priority for deportation. Families should not be torn apart. “Sensitive areas” such as hospitals, schools, doctors’ offices and churches should be respected. “We’re looking for enforcement of just laws, but in a targeted, in a proportionate and in a humane way,” Father Ferguson said. Brooke Hammond Perez, program director for the diocesan Hogar Immigrant Services, had prepared for a large crowd at a recent workshop for Spanish-speakers in the country without legal permission about their civil rights and how to create an emergency plan. But she wasn’t sure how many people would show up that day at Holy Family School in Dale City. There was already a steep drop in attendance at the English classes Hogar offers. For many people, it was simply too risky to leave their homes. — Memorize the phone number of an attorney, a nonprofit organization and a family member. — Sign a document that, upon deportation or detention, gives a loved one power of attorney over your home, bank account and custody of your kids. — Remember that if asked, no one is required to say anything to immigration officials or the police other than their name. Answering questions about legal status or place of birth — even during a routine traffic stop — could lead to deportation in light of ICE’s goal to renew partnerships with local police. “Pretty much any minor offense could expose somebody (if) they have to show up in court,” Perez said. Countless people have walked through Hogar’s doors over the past few weeks hoping to remedy their legal situation – the 33-year-old El Salvador native who came to the U.S. two years ago and found a job at a hotel, only to be raped by her employer; the woman fleeing forced prostitution by the gangs in Honduras. The attorneys at Hogar do what they can for these clients – both of whom qualified for visas. But workshops such as the one at Holy Family help fill in the gaps. And Hogar will typically only host them at a church; ICE has a policy to avoid enforcement at places of worship without prior approval from a supervisory official or exigent circumstances demanding immediate action. Nothing prevents ICE from arresting someone outside church property. Agents did exactly that Feb. 8, apprehending a group of men after they left a hypothermia shelter at Rising Hope Mission Church in Alexandria. Stachyra Lopez is social media coordinator at the Arlington Catholic Herald, newspaper of the Diocese of Arlington.